Instagram reaches 1 billion installs: The most leading smartphone Photo-sharing App reaches the milestone of 1 Billion installs on the Google play store. Formally, this mobile app has created by the Kevin Systrom and Mike Krieger. Then the social media giant Facebook bought the App and kept under the list of Facebook service in 2012. In the year of 2014, the Instagram App reached 300 million users. Now, the app has reached the 1 billion installs on the Google Play Store. 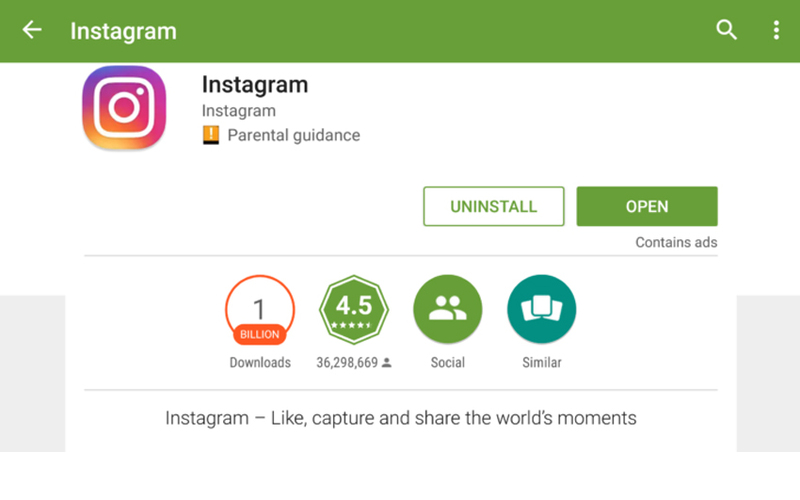 The 19th google android play store App – Instagram reaches 1 billion installs. The Facebook-owned second largest smartphone App in the world reaches the 1 Billion installs on the Google Play store. Lastly, in the September 2014, the Facebook App reached the 1 billion installs and created a record as Facebook is the First Non-google mobile app which hits one of the biggest milestones. Second Facebook App, WhatsApp reached the 1 billion installs in March 2015. Thirdly, the Facebook Messenger reached the 1 billion installs in June 2015. Now, it is the fourth Facebook-owned mobile app, Instagram reaches 1 billion installs. Stay tuned for More Latest News and Updates!